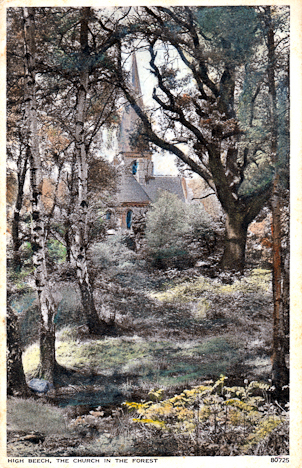 The image on the right is taken from a poscard which was given by John's grandmother to one of her daughters. 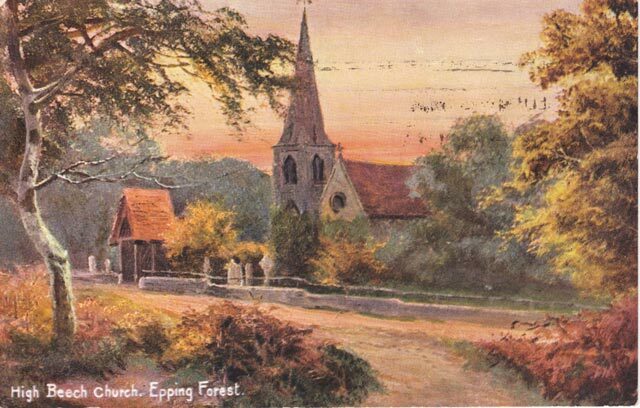 It is of the Church of the Holy Innocents, High Beach in Epping Forest, UK. It is an attractive 19th century structure half-hidden among trees. The photograph is taken from the forest towards the altar end of the church. John's great grand parents, Elizabeth Amelia Webster nee Aburn (1853-1938) and William James Webster (1853-1928) were married in 1874. They are buried in a family plot (grave 341) that is on the right of the pathway going towards the church door. Others buried in the same grave are	Sidney Mallett Webster (1882-1940, cremated remains), Walter Walsh Webster (1885-1976) and his wife, Phyllis Marian Webster nee Bird (c1897-1988). The Webster family home was "Ashleigh" at Oakhill, Woodford Green. Information about William James Webster and his family welcomed. Please email John using the "Feedback" option at the end of this page. Many thanks to Jane Begley (Churchwarden), Nina Pearce, wife of a former vicar of the High Beach Church, my UK cousin John Spencer and Ivy Collins of Bungay, England for their help with identifying the photograph and providing much of the information on this page.